;text-indent:0px;text-transform:none;white-space:normal;word-spacing:0px;background-color:rgb(255,255,255)”>Oral History Summer School workshops just announced. Don't miss this! 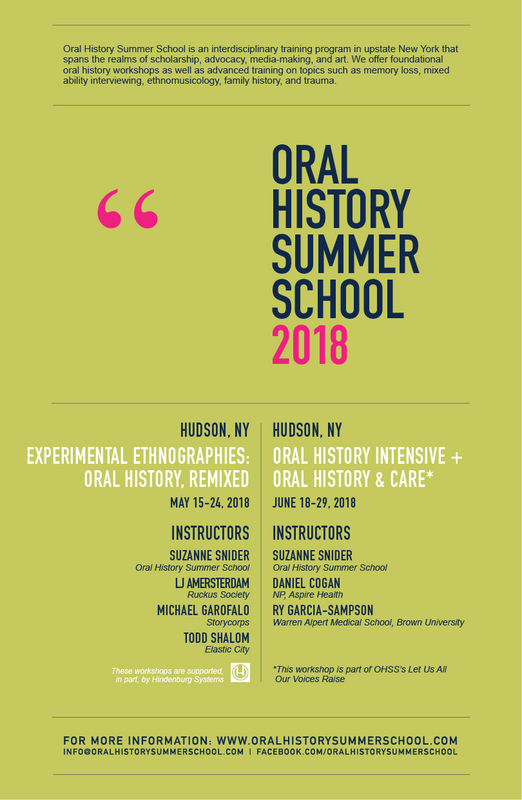 Oral History Summer School is offering two new workshops in Upstate New York (Hudson), this spring/summer. 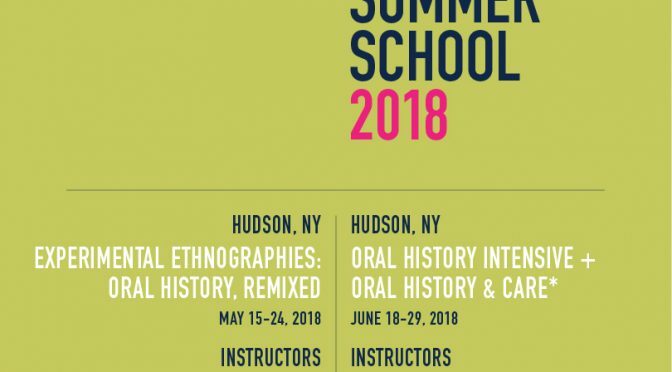 Oral History Summer School is a cross-disciplinary program in Hudson, New York that offers training in oral history methodologies and documentary approaches. We host foundational workshops as well as advanced training on focused topics such as memory loss, mixed ability interviewing, song collection, family history, and trauma narratives/testimony. Hey folks! You want to know how to break into audio/podcast? This is a great option. KALW just announced their upcoming summer radio journalism program. Gain hands-on experience at a local NPR radio station in the gorgeous and amazing Bay Area. The deadline to apply is March 15, 2018, 11:59 p.m. PT. More info and the link to apply is below. Go for it! KALW is calling for applicants for our four-month summer radio journalism program based at KALW public radio, an NPR and BBC affiliate station in San Francisco. We’re looking for creative thinkers who are great writers and storytellers with a passion for reporting on diverse communities and some knowledge of the Bay Area. Experience with audio production and/or journalism is highly preferred. Experience with digital audio editing, print/audio/tv/video journalism, radio or audio production. The program will take place inside the collaborative and supportive community of the KALW newsroom, located in San Francisco's Portola district. You’ll be an integral part of the production of our daily news magazine show, Crosscurrents. Participants will be asked to make a four-month commitment from end of May to beg. of September 2018, minimum 16 hours per week (at least one regularly scheduled eight-hour shift at our studios and another eight hours working in the field). If you’re not able to commit to the entire four months, or the 16 hours, some exceptions may be possible — please explain more in your application. Enrollment in a college or university is not necessary to participate.